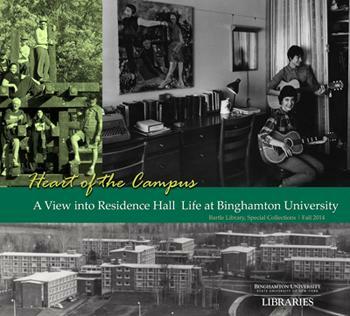 Glenn G. Bartle, for whom the library building at Binghamton University was renamed 40 years ago, was a geologist, professor and college administrator. In the 1950s, he became president of Harpur College, which then became SUNY at Binghamton in 1965. 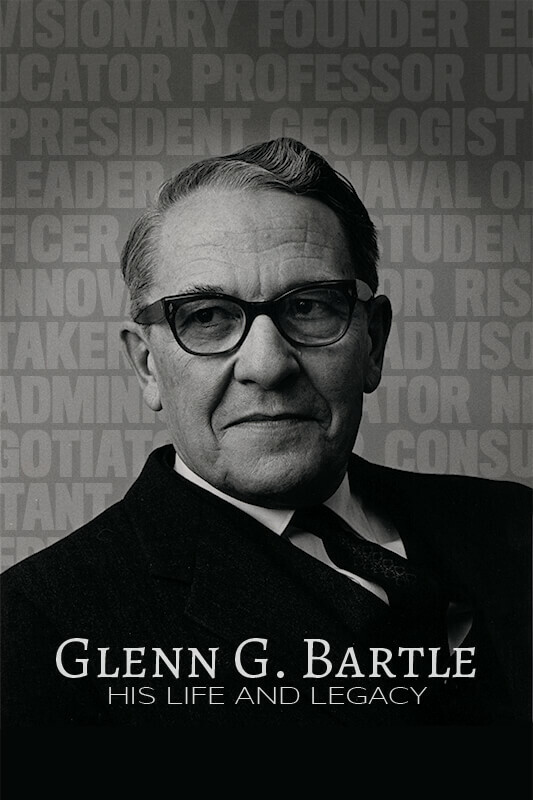 Bartle was instrumental in the development of what has become a preeminent public university. An exhibit on view until February 1, 2019 in Special Collections examines his early training and career as a geologist, his expanding roles in higher education, and the transformative years during which he led the campus and academic programs at the university into new realms. An auxiliary exhibit outside of Special Collections surveys the development of what is now the Glenn G. Bartle Library. The exhibit will be on display until February 15, 2019. The exhibit will be on display until February 1, 2019. Here, There and Everywhere: Traveling Through Special Collections presents a wide variety of travel-related materials from several collections spanning four decades, from travel guides, pamphlets and postcards to passports, travel documents and more. 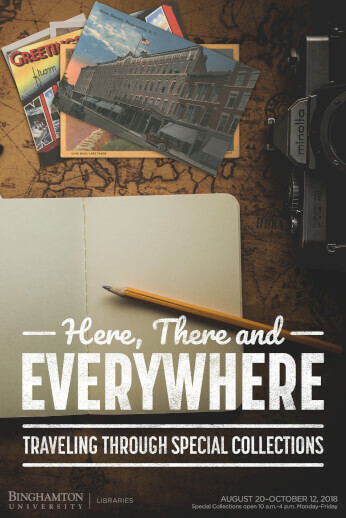 Envision yourself on the Grand Tour of Europe in the 1700s, peruse a 19th century guidebook to a local lake, discover the difficulties of traveling during and after WWII, and see what was happening on the Brooklyn jazz scene in 2001. This exhibition illustrates what travel was like in the Southern Tier, around the U.S., and across the world from the 18th century to today. Take a tour of the different materials that Special Collections has to offer! Abracadabra: Magic in Special Collections highlights materials relating to magic, sorcery and trickery from around the world. Prepare to be amazed as you view materials held in the Libraries' Special Collections, from an early 20th century advertising board for Kaylo the Magician to Maurice Perchron's Magie, rites et mystéres d'Asie to radio scripts for Chandu the Magician. 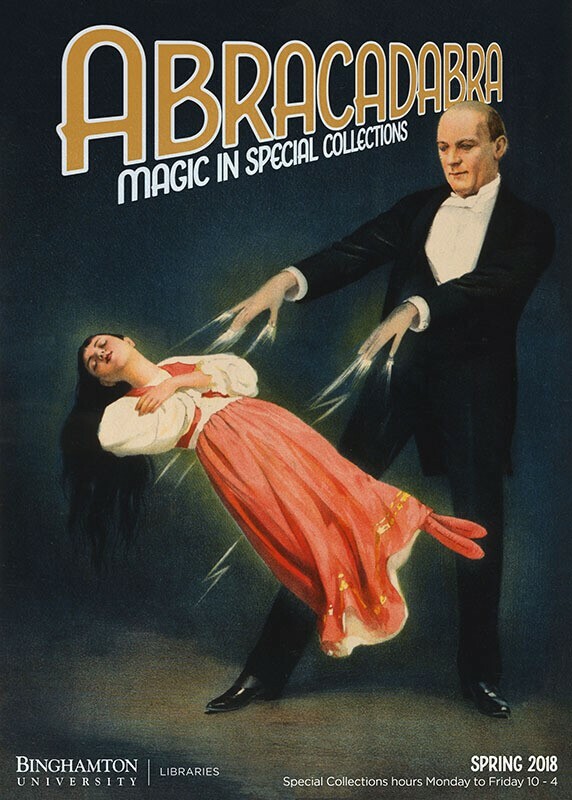 Abracadabra: Magic in Special Collections exhibit is located in the Libraries' Special Collections and University Archives Department in Bartle Library. Vote for Woman Suffrage! 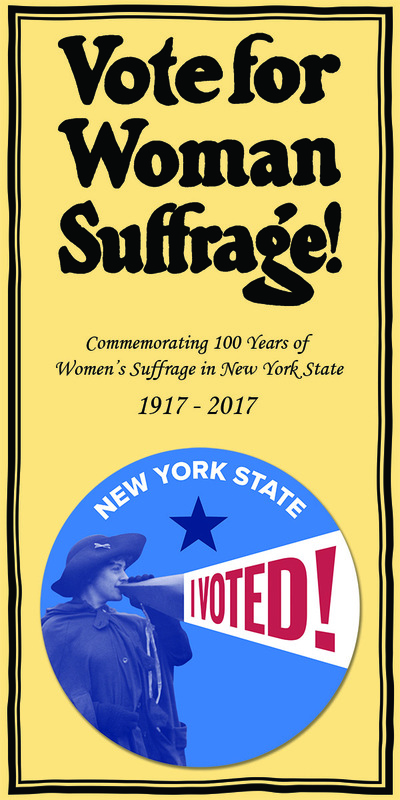 Commemorating 100 Years of Women’s Suffrage in New York State, 1917-2017 exhibit explored the suffrage movement from the Seneca Falls Convention to the fight by suffrage organizations in the Triple Cities for the woman’s right to vote. Items from the re-enactment of the 1913 Binghamton suffrage parade and the 2017 Women’s March will be on display as well. The exhibit was on view from November 15, 2017-January 31, 2018.. This exhibit highlighted the Libraries’ collection of facsimiles of some of the most beautifully illustrated codices, scrolls and printed works from Europe and Asia. Many of these works, such as the Gutenberg Bible or the Book of Kells, are unattainable for most libraries, but facsimiles allow scholars to conduct their research, professors to teach and students to study such exquisite and unique works without having to travel long distances at a great cost of time and expensive. 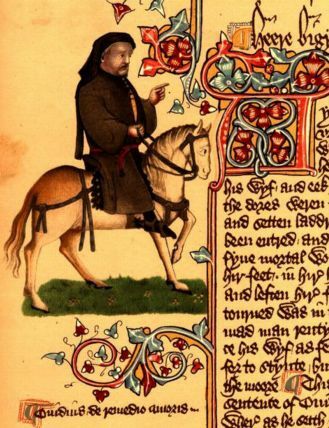 Read more about the Ellesmere Chaucer, or Ellesmere Manuscript of the Canterbury Tales, facsimile. From Aesop to Joachim exhibit was curated by Andrew Roache, BU ’15 and MA ’16, who is now a graduate student at Syracuse University in the MLIS program. April 23, 2016 marks the 400th anniversary of William Shakespeare's death. Shakespeare has been regarded by many as one of the greatest writers in history. 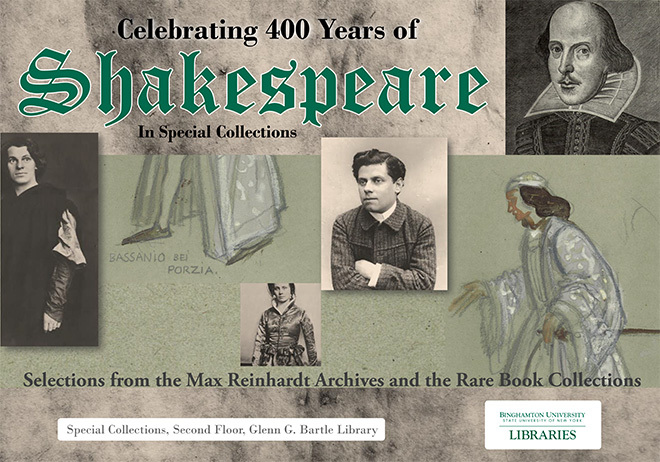 Binghamton University Libraries Special Collections is pleased to offer selections from the Max Reinhardt Archives and the Rare Books Collection to highlight some of Shakespeare's greatest works. Max Reinhardt, the Austrian-born theater and film director, staged productions of many of Shakespeare's works including several different productions of his personal favorite, A Midsummer Night's Dream. He also produced a 1935 film of that work, one of Hollywood's costliest productions up to that time, starring James Cagney, Mickey Rooney and Olivia de Havilland. By definition, a miniature book is one that measures 10 centimeters or less in height. 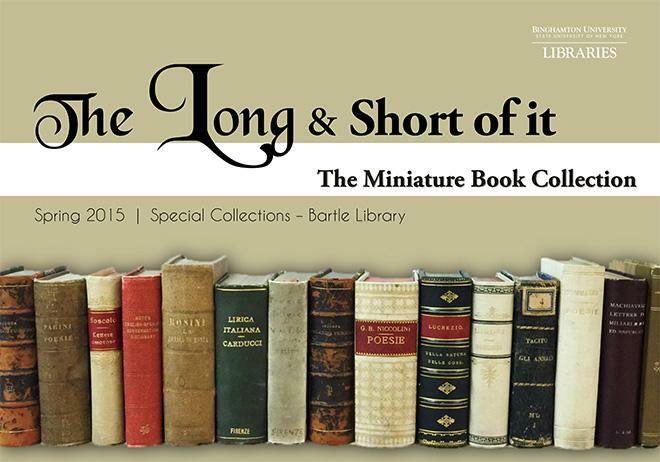 The Libraries' Miniature Book Collection consists of 116 books that spans four centuries from 1605 to 1991. Due to their size, age and/or rarity, miniature books are housed in Special Collections. Often made with the thinnest paper, and printed with the smallest type, this collection consists of elaborately decorated bindings, simple paper wrapped covers, and books with wooden boards. Books on a variety of topics can be found in the collection, a collection that is rich in prose, poetry, philosophy, and religious writings with titles ranging from the classics (La divinia commedia) to the obscure (Napoleon: poeme). Authors represented in miniature include the humanists, the humorous, and the politicians such as Petrarch, Charles Dickens, and George Washington. Producer and director Mack Sennett presided over a motley crew of comedic talent that included Harry Langdon, Ben Turpin, Billy Bevan, Charlie Chaplin, Fatty Arbuckle, Mabel Normand and the Keystone Kops, who slid, slipped and slapped their way across American movie screens. He was known as the innovator of slapstick comedy and film and was once dubbed “The King of Comedy.” Sennett's brand of crude slapstick humor proved to be highly popular with audiences and helped him become one of the most powerful men of early Hollywood. Sennett set up his famed Keystone Studios in 1912 and began cranking out one- and two-reel shorts by the hundreds. Among the pratfalls, chases, character stereotypes and pantomime, Sennett set the tone in Hollywood's early days and created the ground rules for American screen comedy that were to follow. 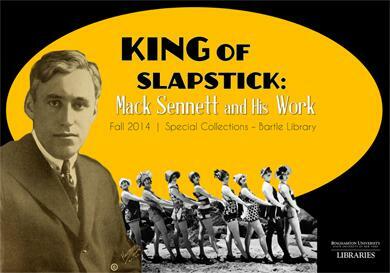 This exhibit featured nformation about Mack Sennett’s work as well as stills from his movies taken from the John K. McLaughlin Collection of Popular Culture. This exhibit explored the history of the residential communities and their unique traditions, events and activities. The exhibit was located in the Special Collections, Preservation and University Archives Department of Bartle Library and was on display through the Fall semester. For additional information about the exhibit please contact the University Archivist at 777-6459 or deligato@binghamton.edu. Tilly Losch was born in 1904 in Vienna, Austria-Hungary. Tilly begin her career in dancing at the age of 15, dancing in the Vienna Ballet and at Burgtheater, until meeting Max Reinhardt in 1927 and Corky B. Cochran soon after, who helped expand her dancing and choreography to productions in the United States and Europe. Tilly danced with Fred Astaire on Broadway, and gained minor roles in films after moving to Hollywood, including The Garden of Allah (1936), The Good Earth (1937), and A Duel in the Sun (1946). In her time recovering from tuberculosis in a sanatorium in Switzerland, Tilly learned to paint, and was fairly successful in her art career, with many gallery showings and even having one painting being purchased by the Tate museum in London. Tilly was married twice; her second marriage was to Lord Henry George Alfred Marius Victor Herbert, the sixth earl of Carnarvon and owner of Highclere Castle (Downton Abbey), more affectionately known as "Porchey." They divorced in 1947, though remained amicable and in close contact for the next three decades. Shortly before her death in 1975, Tilly Losch donated her papers and paintings to the Binghamton University Libraries as it also houses the Max Reinhardt Archives. The collection consists of incoming and outgoing correspondence, as well as legal documents, banking records, personal memorabilia, diaries, press clippings, photographic portraits, and publicity photos. The Tilly Losch Collection also includes a large number of loose sketches, sketchbooks, and over 500 of her paintings. 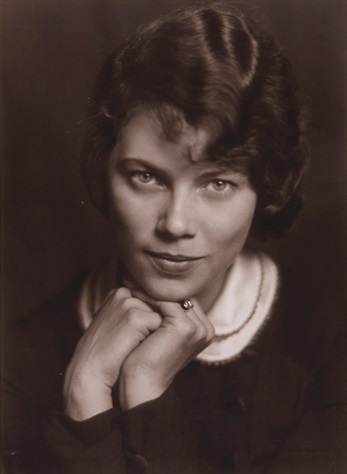 This exhibit included personal memorabilia of Tilly Losch, including various pieces of correspondence and photographs, as well as several of her paintings and sketchbooks. Some of her notable acquaintances include Fred and Adele Astaire, Cecil Beaton, Marlon Brando, Winston Churchill, Cole Porter, and Orson Welles. 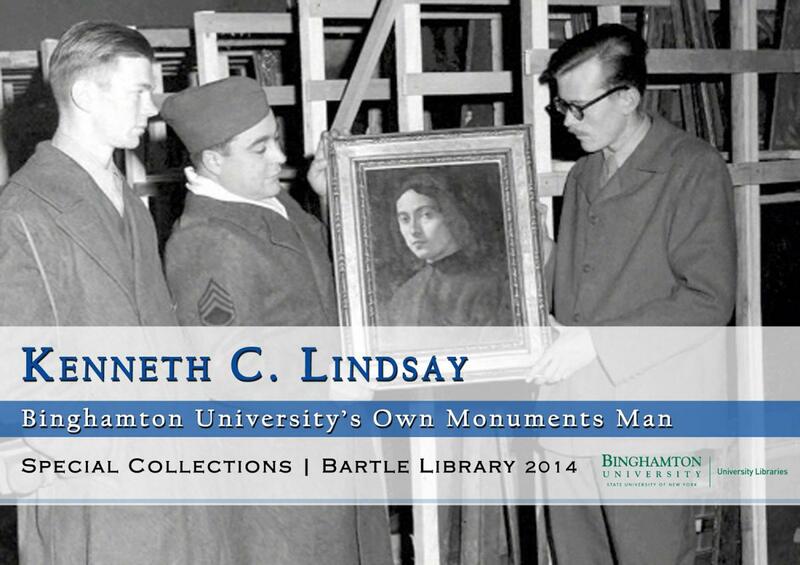 If you went to see The Monuments Men, the film starring George Clooney, it may interest you to know that Binghamton University had its very own Monuments Man, the late Professor Kenneth C. Lindsay, founder of the Department of Art and Art History at Binghamton. Kenneth Lindsay arrived at Harpur College in 1951, but he did important work well before his arrival at Binghamton University. As a Monuments Man, he worked to protect monuments and other cultural treasures from the destruction of World War II. In the last year of the war, the Monuments Men tracked, located, and in the years that followed, returned more than five million artistic and cultural items stolen by Hitler and the Nazis. The Kenneth C. Lindsay exhibition is on view now outside of Special Collections, second floor of the Glenn Bartle Library. Learn more about Linsday's time as a Monuments Man on the Special Collections Blog. Lobby cards, were used to advertise a film, and were similar to posters but smaller, usually 11 in × 14 in. Lobby cards made their first appearance in the early 1910s but are generally no longer used in U.S. theaters and rarely produced for today's films. 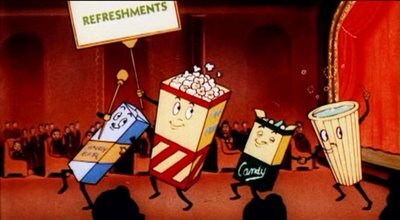 As the name suggests, these small posters were designed for display in a theater's lobby with the intention of luring patrons into the theater by showing glimpses of key scenes from the movie. Let's All Go to the Lobby displays a number of lobby cards from Binghamton University Libraries' Special Collections. Graphic and colorful, this collection represents a wide variety of film genres.